The sight and sound of dejected England players being jeered off at Wembley by supporters who so recently cheered World Cup qualification proved how swiftly football's scenery can shift. 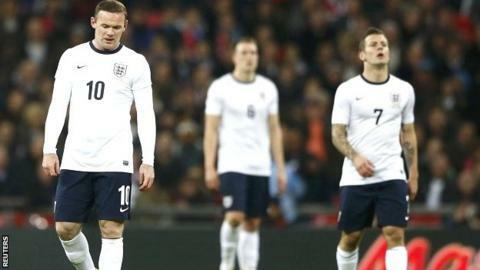 Supporters pay their money and take their choice - but placed in context, the loud raspberry that sent manager Roy Hodgson's side on their way at the end of a sobering 2-0 defeat by Chile was a harsh verdict. Chile were vastly superior to England and resembled the football equivalent of those great South American boxers, tough and durable but with the ability and class to land the significant blows to debilitating effect on their opponents. Barcelona forward Alexis Sanchez was the embodiment of those qualities and the two goals that provided the bookends to this friendly were deserved reward as Chile repeated their 2-0 win at Wembley from 1998. Hodgson wisely refused to criticise those discontented fans, remembering the fine support they have given throughout England's successful World Cup qualifying campaign, but there was an accompanying call for perspective. England's team had an unfamiliar look, with captain Steven Gerrard, Ashley Cole, Joe Hart and Daniel Sturridge among those being kept back with the possibility of facing Germany at Wembley on Tuesday. Hodgson had deliberately experimented with his England selection to give some of his untried undercard a chance to stake their claims, as well as taking a closer look at some senior players in positions that may be closely contested between now and when he picks his first team in Brazil in June. And it meant some tough lessons were learned - not just about those making their introduction to international football but also about some of those fighting for those contentious places. Much of the spotlight fell on England's three debutants, Southampton pair Adam Lallana and Jay Rodriguez, as well as Celtic goalkeeper Fraser Forster. So what did Hodgson learn about those newcomers? The need to test out Hart's potential deputies carries greater urgency given the long decline in form being suffered by Hodgson's publicly preferred number one choice, and Forster was given first strike ahead of Norwich City's John Ruddy. Forster had the start from his nightmares as Sanchez scored in the seventh minute but he was totally blameless for the goal, as he was for the striker's second in stoppage time. He made one good save from Wigan's Jean Beausejour and showed good awareness to drive him wide and away from danger in the first half. Forster had a problem with one kicked clearance but there were no mistakes for Hodgson to consider from the 25-year-old. He did not, however, give off a command that suggested Hodgson can now consign Hart to the sidelines with confidence (he will not anyway) and hand the place to Forster. The man who distinguished himself in Celtic's Champions League games against Barcelona was also not helped by a shoddy, uncertain display from England's defence that will not have eased any first night nerves. Forster's fight is for a place as an understudy along with Ruddy and West Bromwich Albion's Ben Foster, who may yet emerge as Hart's most serious rival when he returns from a foot injury suffered at the beginning of the season. Hodgson will now be even more keen for Hart to show he has rediscovered some of that lost confidence during what could be a busy 90 minutes against Germany. Rodriguez and Lallana have attracted attention throughout Southampton's superb start to the season but this was an international debut of contrasts for the pair. It was a tough night for Rodriguez, who struggled to get into the game and stayed on its periphery, unable to exert any real influence. The chance to make that big statement got away from him and it may be a while before he gets a second opportunity. Lallana, on the other hand, demonstrated that he is worthy of Hodgson's further attention. He was confident enough to take responsibility for an early free-kick that almost resulted in a goal for Phil Jones and he may feel he should have scored with a chance just before half-time. One dreadful corner apart, with Leighton Baines lowering that set-piece standard even further in the second half with an England corner that set Chile clear on the attack, Lallana was always keen for the ball, showed no nerves and also displayed plenty of energy, especially when he chased back in the second half to bail out his defence. As Hodgson explores alternatives and tests younger players, it will not have escaped his attention that more experienced players, those who may have to count on Brazil, were responsible for the worst defending of the night. The battle for the left-back position has been an increasing subject for debate, with Ashley Cole left out of Chelsea's team and Everton defender Leighton Baines excelling in England's last two World Cup qualifiers. Cole may have been an observer from the bench on Friday but this may turn out to have been a very good night for his chances of starting England's opener in Brazil. Baines, for such a high-class player, had a very poor game. It certainly offered plenty of evidence to those who support Cole's case as the better defender. He was slow to react in the box when Sanchez headed Chile's first goal, allowing the striker time and space to steal in front of him to score. It was the signal for a disappointing display and was the sort of lapse in concentration that will be punished by the best strikers, as indeed it was at Wembley. Baines's form at club level for Everton this season, after a summer of speculation linking him with Manchester United, has not been at its best and here even his normally world-class set-piece play was awry. The dreadful second-half corner mentioned previously was the nadir. Cole will get his chance against Germany - although Baines has shown such quality in the very recent past that it would be a mistake to simply assume he has been overtaken again. Gary Cahill has been a reliable figure in England's qualifiers but his partnership with Jones will not have filled Hodgson, or indeed anyone else apart from Chile's strikers, with confidence. Cahill's display was epitomised by his careless concession of possession and attempted recovery that ended with Sanchez lofting an audacious finish over Forster to confirm Chile's win. As with Baines, this is the sort of thing that will not go unpunished when England face the best. Like Cole, Phil Jagielka's standing may have been increased by a night of bench-warming. Liverpool's Glen Johnson did not cover himself in glory either as he was so often caught out of position by the speed of Chile's counter-attacking. At least these flaws were exposed in a friendly that will provide much for Hodgson's database as he puts together his plans for Brazil. Hodgson was right to call for perspective. This was, by its very nature, a learning experience - and he will at least hope some have been learned as England's life is not likely to get any easier when Germany arrive at Wembley on Tuesday.